Learn the simple rules of Color Theory…then break them! In this 6-hour class, we’ll explore the basic concepts of color theory through use of the color wheel, applying them to our class project. 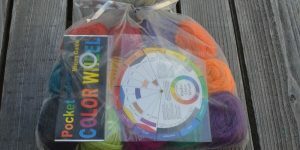 Each student will receive a yarn kit and pattern to knit a modular felted bag. Work each module to learn first hand what different color combinations can do! Color Wheel Kit (cost is included in the class fee and will be provided in class), 1 pair size 3.5 mm Double Point Needles or other needles, 1 pair size 4mm Double Point Needles or other needles, Tapestry Needle, Note-taking supplies. There is no homework for this class. * You can bring your lunch or there are a few options in the surrounding area to buy lunch. The IGA across the street has soup and sandwiches and there is a coffee shop across the street as well.